The road between Thetford and Diss feels like a line drawn beneath Norfolk, like a final statement, as if to say this far and no further. And yet there is a soft underbelly of straggling villages between here and the Little Ouse, and one of them is Riddlesworth. Having said that, there is not much to Riddlesworth except for the Hall, which is a private school. There is only one reason that the school is world-famous, and we will come back to it in a moment. A bumpy track takes you down to the Hall, clustered about with attendant buildings, one of which is this church. Beyond here, the track becomes little more than a bridleway for the half mile to Gasthorpe. Gasthorpe's ruined church is a gap-toothed sentinel, but you would not even know that St Peter existed unless you came down here to look for it. The largely restored building sits on a comfy velvet cushion of green, and even in the drizzle of this miserable March day there was something attractively domestic about it. The only unusual feature is the pair of large doors into the base of the tower - was this once a processional way? The Hall, next door, is rather more striking, looking rather like a lunatic asylum which had escaped from the Loire Valley, as one writer described it. We were not expecting to find the church open, and so I suppose it would be true to say that we were not disappointed. There are several churches in this area that are locked without keyholders, as if the miserable shadow of Thetford has stretched out and frozen the churchwardens' hearts. Given how well protected this building is by its location, it seems quite unreasonable for it not to be accessible, but there is possibly a different reason why security, and privacy, are guarded here. In the early 1970s, one of the pupils of Riddlesworth Hall School was Diana Spencer, the future Princess of Wales. This was before her father inherited the title and she became a Lady, and nobody could possibly have foreseen that she would one day become the most famous woman in the world. In the years after her death this obscure backwater of south Norfolk became a goal for Diana-worshippers. The school itself was obviously off-limits, but given that she worshipped in this church every Sunday for years, there was a danger of it falling prey to souvenir hunters. But those days are over now, surely? 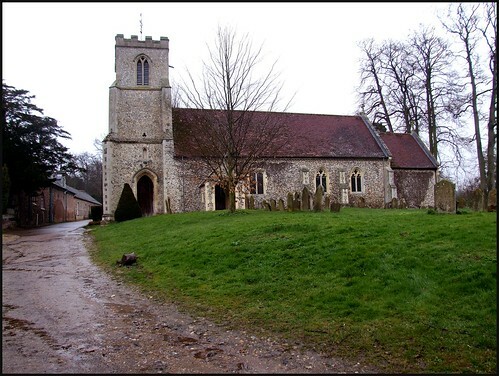 As it is, St Peter would have little to interest the non-Royalist if it were not for the dereliction of neighbouring Knettishall church, across the Suffolk border, in the 1930s. Cautley itemised the furnishings removed to Riddlesworth at that time: A fine set of Charles I arms with the 1632 overpainted 1666, a Stuart pulpit, the three-sided Laudian communion rails, a late Stuart holy table and font cover, an 18th century chair, and two painted panels, one of St Edmund and one of St Peter. Cautley hazarded that these panels had come from a reredos, but Mortlock noticed that one of them has what appears to be a squint hole in it, suggesting that they are, in fact, from a screen. They are in any case repainted. Looking through the window, the most striking object is the memorial to Drue Drury, who died a year short of his century in 1619. As Mortlock says, he lived through stirring times, seeing the English Reformation from start to finish. As if this was not enough, he went on to become the Governor of the Tower of London, responsible for guarding not only Mary Queen of Scots, but hundreds of Catholics before their grisly death at the hands of the Elizabethan Terror. The monument shows him kneeling behind curtains which are being drawn back by two angels. Let's hope he's praying for forgiveness. I had not seen anything quite like this before, but less than a week later I came across almost the same thing at North Barningham on the far side of Norfolk.